Are you struggling to get to grips with the Chase Freedom® and Sapphire Preferred® credit cards? At first glance, it’s hard to separate them. Neither card will charge you an annual fee in the first year and both offer a standard 1% rewards rate on regular purchases outside of bonus categories. But when you look a little deeper, you will discover both Chase credit cards have a lot going for them. The Sapphire Preferred® card rewards frequent travelers generously while the Freedom® card features as much as 5% cash back rewards. So, which card is best: Chase Freedom® or Sapphire®? 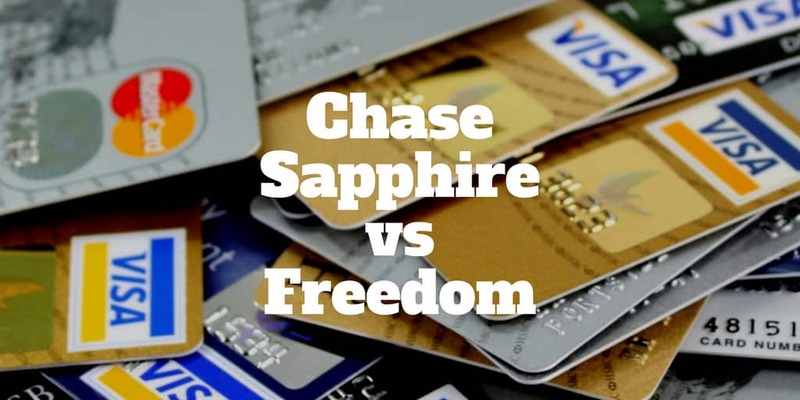 Chase Credit Card Comparison: Freedom or Sapphire? Both the Chase Freedom® credit card and Chase Sapphire Preferred® card reward day-to-day spending, but the Freedom® card shines thanks to its rotating bonus categories. The way rotating categories work is every 3 months you will be notified that spending in a certain category will reward you with higher points. For example, spending at grocery stores may earn 5% cash back rewards during one quarter while spending at gas stations may earn you 5% another quarter. All other spending earns 1% cash back rewards. The Chase Sapphire Preferred® card won’t reward you as much for daily spending but stands out for its travel and dining rewards perks. You earn 2 points for every dollar you spend on dining out and travel and 1 point for every dollar spent on other purchases. The Sapphire Preferred® card is by far the better choice for frequent travelers. Not only do you earn 2 points for every dollar spent on travel, but when you are overseas you won’t be hit with pesky foreign transaction fees – unlike the Freedom® card which charges a 3% foreign exchange fee on purchases made abroad. Another benefit of the Sapphire Preferred® card, which isn’t necessarily obvious at first glance, is that each point earned is worth 25% more in value when redeemed through the Chase Ultimate Rewards® portal. That means on regular purchases that earn 1% cash back with the Freedom® card or 1 point on the Sapphire Preferred® card, your money goes further with the Sapphire® card. The way it works is you can book flights and travel via the Chase Ultimate Rewards® portal and get 25% more your points than if you cashed in your points and booked directly with an airline or via a third-party website, like Orbitz. Another bonus of the Sapphire Preferred® card is the ability to transfer points to airline loyalty rewards programs. Generally, the exchange rate is 1-to-1, meaning each point you earn from your credit card spending translates to 1 point in the loyalty program. Where the Sapphire Preferred® card really knocks the socks off the Freedom® card is in the area of sign-up bonus rewards. After you spend $4,000 in the first 3 months after opening an account, you will receive 50,000 bonus points, which translates to $500 of cash value. When you redeem them for travel in the Chase Ultimate Rewards® portal, points are worth 25% more, meaning the total value is $625. The sign-up bonus for the Freedom® card is not shoddy by any means. You receive a $150 bonus after you spend $500 on it in the first 3 months after opening an account. But next to the Sapphire® card, the bonus is fairly paltry. 25% bonus when redeeming points via Chase Ultimate Rewards® portal. While neither card will cost you a penny in year one, the Sapphire Preferred® card applies an annual $95 charge after year one. The initial sign-up bonus is so generous (after you spend $4,000 in the first 3 months) that it pays for at least five years worth of annual charges if you were to convert your sign-up bonus reward points to cash. Of course, they go 25% further when you redeem them through the Chase Ultimate Rewards® portal but the point really is that even though an annual cost applies, the rewards more than compensate you. Ignoring the sign-up bonus, you might be wondering how much you need to spend each year to breakeven on the annual Sapphire Preferred® card fee. If you didn’t dine out or travel at all, you would need to spend a whopping $95,000 per year. However, you earn 2X points when traveling and dining out, so depending on how much you spend at restaurants and travel versus other purchases, the breakeven amount may be quite a bit lower. Nevertheless, if you prefer to avoid an annual fee altogether, the Freedom® card is the better choice. The choice between the Chase Freedom and Sapphire Preferred cards very much depends on your spending habits and preferences. If the idea of paying attention to which category earns most rewards per quarter irks you then steer clear of the Freedom® card. On the other hand, if you don’t travel or dine out much, the Sapphire Preferred® card won’t be a great match. However, if frequent travel, eating out and exploring other countries is right up your alley, the Sapphire Preferred® card is a much better bet. It’s also a better choice if you like the idea of a generous sign-up bonus. But don’t expect the sky-high 5% cash back rewards on rotating categories that the Freedom® card offers. You’ll be limited to earn 2x points on travel and dining out with the Sapphire Preferred® card. Cardholders who like the idea of cash back versus points will find the Freedom® card to be more palatable. It’s also a superior choice if you want to avoid the hassle and cost of an annual fee. Plus, if you are willing to take a little more time to make the most of your reward points opportunities, the Freedom® card is hard to beat for its 5% cash back offer, albeit up to a limit of $1,500 per quarter. While each card has its own appeal, the reality is you could even take the plunge and choose both cards. When booking flights, use the Chase Sapphire Preferred® card, and when buying groceries or filling up gas when the perks are highest, swipe the Freedom® card so you get the best of both worlds. Do you know the difference between Chase Freedom and Chase Sapphire Preferred cards? What other perks or bonuses are worth pointing out? Share your suggestions in the comments below. ‹ Is Prime Pantry Worth It?